We are still working on the coordination it takes to get the puffs from hand to mouth! She is great at grabbing them and putting it to her mouth - but letting those puffs out of her tight grip can be a little tricky! Dawson is SO happy about that because that means she drops a lot of puffs in the process and he thinks they are MIGHTY tasty! Maybe this baby isn't so bad after all! Hey - these are pretty good! Why are you just now telling me about this? Hey mom? Can we have a snack EVERY day??? And how about maybe those Oreos we see you eating??? Awwww Dawson is so cute!! And of course so is Harper. :) Love the last picture. Dawson's face is so cute. Just like when I was pregnant a few months behind you, I look to your blog to know what's next. I actually had no idea that dry cereal was so close! It is amazing to me how quickly they develop and change! Awww...she is growing up way too fast! Which I know is news to you, ha! I remember the puff days and Grace couldn't get enough of them either!! I have to tell you are such and inpsiration to me Kelly!! I love reading your blog and seeing Harper she is such a cutie!! I love the last picture she looks like she enjoyed snack time very much!!! Happy Sunday!!! I like your high chair, what kind is it? Very cute! Evie likes the puffs too. She also LOVES yogurt melts cut or broken in half. Can't get her to drink much out of her cup but she thinks it is really fun to play with. Love the pictures! That's so cute. Our Trixie Lulu can't wait until DD starts eating--she is always searching for dropped food. 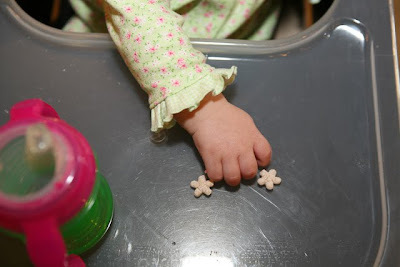 We have started DD on cereal--her pediatrician wanted her to get used to eating between 4-6 months, b/c at 6 months she starts getting 3 meals of baby food a day! She's growing up so fast. So cute!!! I just gave Mollie Kate her first Oreo last night and of course she loved it!! Oh my gosh she is growing up so fast! She makes the cutest expressions! CUTE!!!! Harper is such a model!!! I just realized one of the reasons I love reading your blog so much... it brings back SO many memories of my life with my first daughter - I really feel like I'm reliving that part of my life! Harper is absolutely precious and I love that you cherish every moment and milestone with her. Now I just wonder if your life will be as hectic and disorderly as mine became after baby #2 came along ha! (Not to scare you, though, because I'm sure it had more to do with the fact that I also became a working mom between #1 and #2). Haha that is too cute. Exspecially that last pic of both of them. Very cute!!! We loved puffs..and dogs are great crumb catchers! The last pic is so cute! I think you need to frame it. Snack time is fun when they are so little. 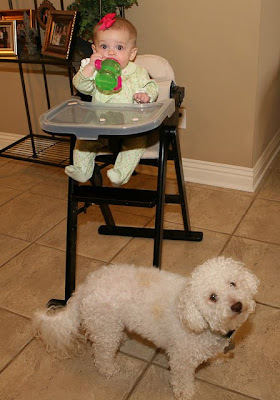 Our yorkie feels the same way about our baby:) love the snack time "leftovers." Love it! Don't worry, Dawson will grow to love her because he has now learned that they love to drop food! ha! My nephew does it on purpose now....the thinks that it is so funny. The dogs get more than he does. I am sure my little one will be feeding our dogs soon! Oh Kelly, she is just getting too big. Of course she also gets prettier and prettier every day too! You and Scott must be on Cloud 9! Squeeze that angel for me! 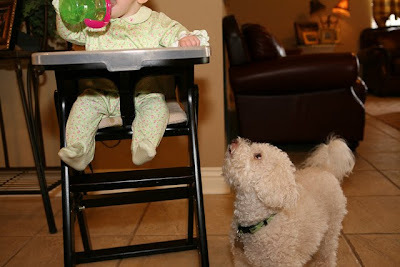 I hope that little Harper doesn't start throwing her sippy cup at your furry little angel (Dawson)! I only say that because my son does it... and we have a chihuahua, ouch! Your blog is so wonderful and Harper is BEYOND adorable!! Ridley's loving his puffs! We're practicing a lot with them. He gets more on the floor than in his mouth, but he's doing really well with them. Harper is just totally precious...as always! Such a cutie, as ever. SO cute!!! I'm all about those oreos too! I bet Dawson thinks his life just got even better!Haha! Those puffs are a great little snack for Harper! We never realized how much food our daughter dropped on the floor until we boarded our dogs and found peas everywhere! That's why we have dogs...to clean up after the baby! I'm a big fan of the puffs myself and I'm 33 years old! So cute! We have milk and oreos for our snack today!!! Adorable photos!! Puffs are lifesavers sometimes too!! Amazing how quick they grow up. 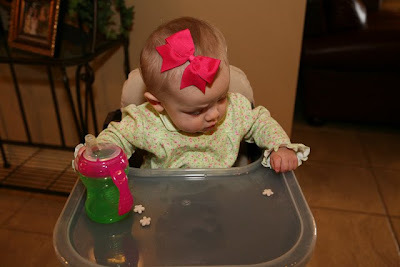 Look at her sitting there feeding herself and using a sippy cup...time sure flies! I love seeing her sweet little hands try to pick up those treats :) So precious! And I LOVE the College Day Family photo in the post below...SO ADORABLE!! Uhhmmm I have a confession to make...I love eating those puffs. I buy them and eat them myself sometimes...low in calories and tasty, what more could a girl want. I love the picture of Haper and Dawson. Both look so cute and you can just tell that Dawson is loving getting an extra little treat here and there. What I noticed is how much hair Harper is getting! 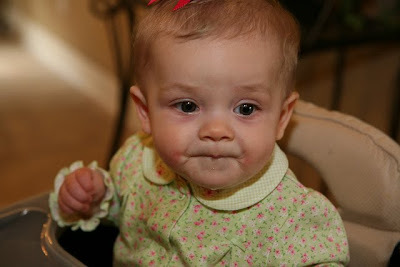 :-) My grand-daughter, Grace, loves those puffs too as well as graham crackers. Our dog Kona decided Grace was wonderful after she dropped lots of puffs and graham crackers for her. So cute! Don't you love the look on their little faces when they're experiencing something new for the first time? She has the sweetest little face. Bless Dawson's heart. He has found his calling in life,,,cleaning up after Harper. Wait until she learns to feed him. One for Dawson, one for Harper. My sister shared dog biscuits with the dog like that. Such cute photos! Too cute! Our dogs are the vacuum cleaners in this house! Isn't it just the sweetest thing when they start eating "real" food?? Harper is just adorable. Harper looks SO grown up in that 4th picture! BIG GIRL AND HER PUFFS! Oh, puffs are the best! And little outfits with footies are too!! I bet Dawson will be glad when snacktime includes an Oreo too. I am babysitting my great nephew who is 14 months old this weekend and I am feeding him the same snacks. He loves those and cheerios and mashed potatoes. Harper is so cute in her jammies and her cute bow!! Aww! Both of your babies look like they are loving the new snack time. London loves her snack time too! We started with those puffs and now she usually has a sliced banana or pear. They grow up soooo fast! Those puffs are so easy and fun... be prepared to find them in her diaper... amongst other creative places! Every photo is adorable but the last photo is the best I've seen in a looooong time. I love it. Kelly I think that ur wonderful! You r a daughter of God and can't possibly do all of what peole ask of you! Peace be with you and your family! Be conifdent in who you are and what you do! !